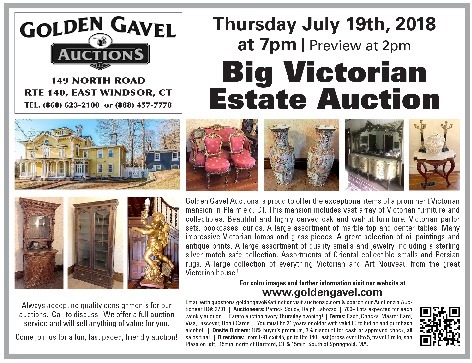 Golden Gavel Auctions is proud to offer the exceptional items of a prominent Victorian mansion in Plainfield, CT. 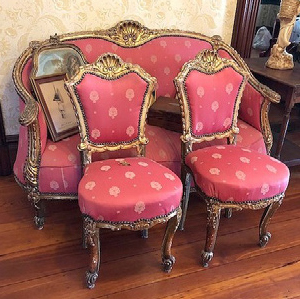 This mansion includes vast array of Victorian furniture and collectibles. Beautiful and highly carved oak and walnut furniture. Victorian parlor sets, bookcases, curios. A large assortment of marble top and center tables. Many impressive Victorian lamps and glass pieces. A great selection of oil paintings and antique prints. A large assortment of quality smalls and jewelry including a sterling silver match safe collection. Assortments of Oriental collectible smalls and Persian rugs. A large collection of everything Victorian and Art Nouveau from the great Victorian house! 700+ Lots expected for each weekly auction. | Estate auction every Thursday evening! Terms: Cash, Checks, Master Card, Visa, Discover, Debit Cards. | You must be 21 years or older with valid ID to bid on and purchase alcohol. Directions: From I-91 exit 45, go to Rte 140 East (cross over Rte 5, travel 1 mile, see Plaza on left). 15min. north of Hartford, CT & 15min. South of Springfield, MA.